MR. HEALY: Sir, I think because the Tribunal is not necessarily moving on to something new, but moving on to something that perhaps was last mentioned some considerable time ago and is not a direct continuation of some of the evidence that’s been heard in the last few days, it might be appropriate just to make one or two opening remarks in connection with the evidence to be given by Mr. Hocepied, and to some extent, the evidence that will also be given at a later point by Mr. Jarlath Burke. Now, it will be recalled that in the Opening Statement Mr. Coughlan made reference to a letter from Commissioner van Miert to Mr. Michael Lowry as Minister. The letter was dated 14th July 1995. It contained, I think, what has been called the Commission’s imprimatur, as it were, for the Department’s proposals as to how the competition for the second GSM licence should be revamped in light of the Commission’s objection to the auction element of the process. I think Mr. Loughrey called it something slightly less, a nihil obstat. The letter was the culmination of a dialogue between the Department and the Commission dating from around the end of April. Mr. Martin Brennan and Mr. Fintan Towey have given a significant amount of evidence concerning this aspect of the process. Mr. Brennan and Mr. Towey were asked about a copy of one page of Mr. van Miert’s letter which appeared to have found its way, as the Tribunal then thought, to Esat Telecom in the person of its chief regulatory counsel, Mr. Jarlath Burke. On a reasonable interpretation, at least one reasonable interpretation, the letter from the Commission contained confidential information. The Department’s correspondence in connection with the matter was clearly stamped confidential and the content of the correspondence, I think, made it clear that the Department regarded the dialogue as a confidential one. I think I am right in saying that both Mr. Brennan and Mr. Towey confirmed that they so regarded the correspondence, as did Mr. Loughrey. that he does not regard the portion of the letter that he received, the first page, as confidential. He has informed the Tribunal that he received the document from the Commission, and that it is most likely that it came from Mr. Christian Hocepied. He has asserted, however, that this did not involve any impropriety on the part of himself or Mr. Hocepied. Mr. Hocepied has stated that there appears to be no concrete evidence indicating that the document found on Esat Telecom’s files was transmitted directly in the Comeptition Directorate of the Commission, the Directorate with which Mr. Burke was dealing and in which Mr. Hocepied has worked. He has informed the Tribunal he does not remember having sent a copy or asking his secretary to send a copy of the Commission’s letter to Mr. Burke or to Esat Telecom. Now, the Tribunal’s perspective in relation to this matter is multi-facetted. If, as the Department contend, the document was a confidential one, and if the Tribunal ultimately concludes that it could have given an advantage or at least an edge to one competitor over another, assuming that competitor was the only one who had it, the Tribunal will wish to ascertain how the document came into the possession of Esat Telecom and whether this entailed any intervention or any action on the part of Mr. Lowry. Obviously, in conducting that inquiry, it will be important to endeavour to ascertain whether the document came from the Department or from the EU or possibly some other source. If Mr. Lowry was not involved directly or indirectly in the transmission of the document to Mr. Burke, then obviously that is something upon which the Tribunal will wish to reach a conclusion and that will be a very important conclusion. What’s more, if, in the event the Tribunal concludes that Mr. Lowry had no involvement in the transmission of this document to Esat Telecom, and if the Tribunal further concluded that this document could have given an edge or an advantage to Esat Telecom in the process resulting ultimately in the success of its application, this is something which ought to be clarified in fairness to Mr. Lowry, as it would be an edge or an advantage obtained without any intervention direct or indirect on his part. Whether there was any impropriety or not in the transmission of the document to Mr. Burke is of no concern directly to the Tribunal, as long as it can not be shown to have involved Mr. Lowry. 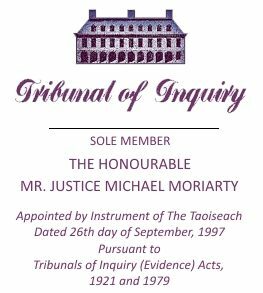 It’s important to state at this point, that the Tribunal is not reaching any conclusion as to whether it was improper or not, and as I have already said, it has been asserted on the part of Mr. Burke, and I think on behalf of Mr. O’Brien, that there was no impropriety. I should also say, because Mr. Burke will not be giving evidence today or tomorrow and it may be sometime before he gives evidence, that as regulatory counsel for Esat Telecom, Mr. Burke appears to have had a course of dealings with the EU Commission. The Tribunal is not aware of the full extent of his dealings with the Commission and they appear to have involved, to some degree, Esat Digifone’s affairs. But it is again important to note that there could have been no impropriety whatsoever on the part of Esat Telecom or Esat Digifone or Mr. Burke in lobbying the EU Commission with regard to any aspect of the GSM process at any time, either prior to, during or even after the process, and the fact that Mr. Burke may have had regular dealings with the Commission in regard to Esat Telecom or Esat Digifone’s affairs, including any aspect of the capping of the process, or the changing of the weightings and so forth, would be wholly legitimate.